I was previously running a doggy day care and enjoyed every moment, but am even happier now I have moved into the veterinary world. I own a handsome Springer Spaniel called Baz, who has been a wonderful part of our family for 10 years. I have always loved animals from a young age and have had hamsters, rats, guinea pigs, fish and dogs. 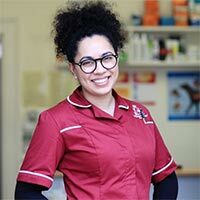 I have always dreamt of becoming a veterinary nurse and will start my nurse training eventually. Meanwhile I am enjoying all the cuddles with the pets we see in reception!